While we were waiting on line at the salad bar aboard the Ioffe, a former Russian research vessel, my friend Denise said something to me that pretty much summed up our Antarctica Marathon trip. "Cindy," she said, "isn't everything about this trip really a microcosm of how the world should be?" I froze, then said, "That's it! That's why this all is so special. We are experiencing what everything else should be!" 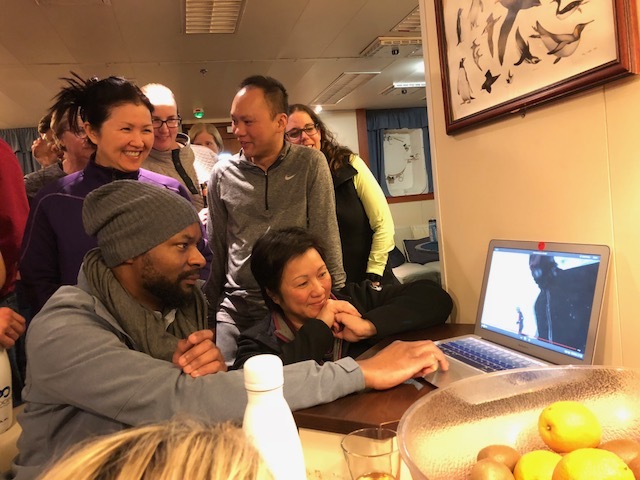 For almost two weeks, the 99 women and 94 men who signed up to run a marathon or a half marathon in Antarctica with Marathon Tours and Travel experienced a kind of utopia that none of us had experienced before, and perhaps we never would again. First of all, we were unplugged. Once we left Ushuaia, the southernmost city in the world, and got on our ship, the Ioffe, we were unplugged from all of our electronics. 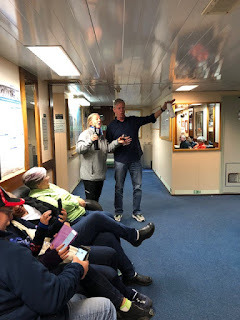 Our time on the ship was spent talking with each other, not reading posts on our phones or computers about the world's problems. 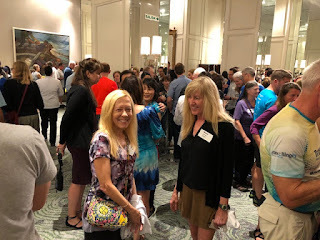 We were all runners or supporters of runners, and although we were from 17 different countries, our love of running, the outdoors, and travel gave us an instant bond that created great friendships. We all got along, all the time. Next, we were so busy DOING things, always being challenged. 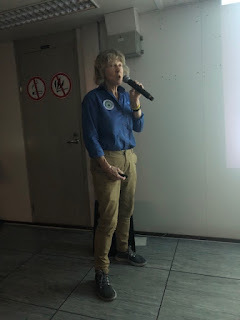 Before the races, we spent time getting oriented on the Ioffe as to how to get off the ship to run the marathon and go sightseeing on the excursions. We had to learn how to put on the gear over our clothing so we could climb down the gangway into the Zodiac boats that would take us to the Antarctic peninsula and continent. We were also taught how to sterilize our gear so as to not transfer organisms and pollutants from one site to another. 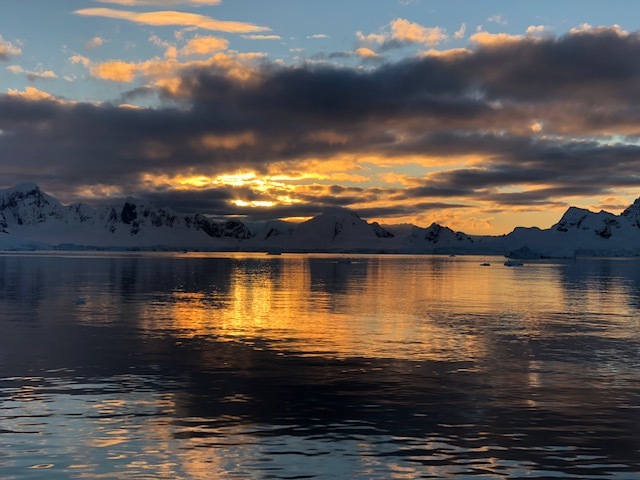 Our guides were dedicated to ensure that Antarctica remain as pristine as possible. We went to lectures that taught us what to expect in Antarctica once we got there, and we found out about the history and geography of the land we were about to visit. 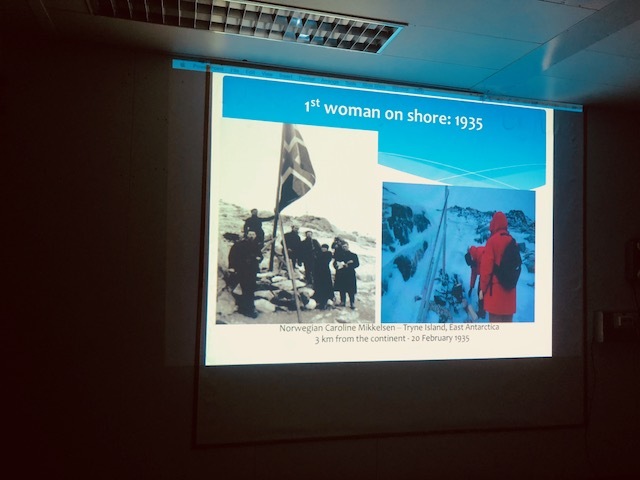 I especially liked Karen's lecture about the women who were the early pioneers in Antarctica. and David Sinclair's (also known as Sinckers) One Ocean Expedition staff. The staff from both groups worked around the clock, ensuring that our experience in Antarctica was top notch every single day. And it was! The excursions that we went on, by Zodiac boat and on foot, were so stunning, so other worldly, that it is difficult to describe. Several times I heard both guests and staff describe what we were seeing as a religious experience. It was, for all of us, in the true meaning of the word. The wildlife and scenery we saw on those morning and afternoon excursions, the silence as we digested the beauty around us, the chilly and pure air and the blue/white icebergs and glaciers - it was magical, as if it weren't real, but it were only pictures from a child's storybook. And the whales! At breakfast one morning, Sinckers told us that we would definitely see whales on the excursions. And if we didn't, we could have all his assets, including his house. He also told us he was a lawyer. As I am also a lawyer, I wasn't about to cut him any slack, and was already envisioning my lawsuit against him if we didn't see any whales. But he did not disappoint, and none of us got any of Sinckers' assets. Not more than one minute after we all got into our Zodiacs on the first day of whale watching, we had a pack of whales swim over to our boat. For about 15 minutes, they frolicked between our two boats, never hurting us but coming close enough to us so that we could touch them if we wanted. But we didn't - all we did was enjoy this experience, watching the whales swimming, gracefully pirouetting, and "spy hopping" - where they lift their heads out of the water and eyeball us directly, enchanting us with their antics. It was an experience unrivalled by anything any of us had ever seen. The whale watching was an experience none of us will ever forget. The seals - I will spare you the pictures, but we saw - several times - a leopard seal grabbing a baby penguin in his mouth, thrashing it from side to side, and then eating it. And a couple of the Zodiacs had leopard seals come right up to and bite the boat! Luckily, the boats did not sink, the passengers did not go into the water, and the staff repaired the boats as soon as they got back on the Ioffee. Drama on the water, unplanned but exciting! We also got to hike up what I would call a mountain! After getting off our Zodiacs and walking through the frigid ocean water in our boats and wet skins (never feeling chill or wet!) we hiked to a high point on the continent of Antarctica. It was such hard hiking that we were sweating as we climbed; some of us shed some layers along the way. Larry and I atop a high point on the continent of Antarctica! In addition to all the sightseeing and hiking, we ran a race - a marathon or a half marathon on Antarctica, at King George Island. For me, for all of us - it was the race of a lifetime. We all had to sign up at least 3 years in advance, so the anticipation was building up for years... I had several friends say, "you've been talking about running Antarctica for years? Haven't you run that race yet?" Well, on March 16, 2018, we finally got to run our race, which for many of us was the final race on our 7th Continent. We started off in, appropriately, in a blizzard. 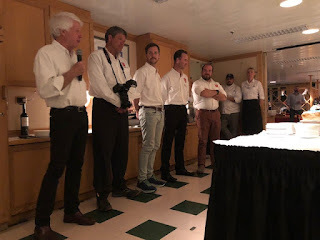 First, kudos to Marathon Tours for doing everything they could to prepare all of us for a race in Antarctica. Numerous emails detailing what we needed for the race were sent out to us. We received a checklist of appropriate gear. We had a few conference calls with Thom and Jeff where numerous questions were answered. Last year's video of the race was helpful to watch. And twenty of us, including me, participated in a month long program with a past Antarctica marathoner, Christine, who was also a graduate student in sports psychology. Christine had us visualize in advance, what we could expect at the marathon. But a blizzard? I hadn't spent a whole day outside in a blizzard since... the Nixon administration. And look how that turned out! But all was fine once we started running. I began running with Sheri, my running buddy on 4 continents over the last 5 years. (Actually, 5 Continents, if you count the London Marathon in 2012. We hadn't yet met in London, but it turned out that we finished the marathon within seconds of each other.) It was Sheri's idea, after we were the first two American women to run all 6 World Marathon Majors, to tackle the 7 Continents. Penguins are pretty much the coolest and cutest animals on the planet. They just prance around in their tuxedos and don't hurt anyway. Seals - not so much. They are violent! In addition to eating penguins, they bite people! 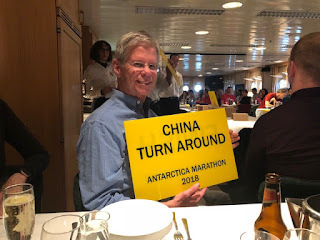 Luckily, we had a volunteer, Larry, at the Great Wall of China turnaround who risked his own life and limb, when a leopard seal appeared right on the course, Larry scared him away by pretending to be a bear and roaring at the seal, chasing the seal away before the seal interfered with the race. 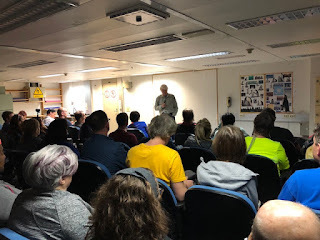 About the volunteers - I have run 18 marathons, and all have had volunteers there, handing out water, giving out medals, pointing us in the right directions. But nowhere are there volunteers like the 7 volunteers we had at the Antarctica Marathon. There were outside in the sub freezing temperatures for over 7 hours, not keeping warm by running like we were, but still helped us by cheering us on, pointing us in the right direction, taking our pictures, reminding us "you are running in Antarctica, how cool is that?" or telling us to "get out of here already, keep running!" like Larry did at the China turnaround. And then there was Molly, the singing volunteer. She sang and sang and sang... real songs and invented songs. 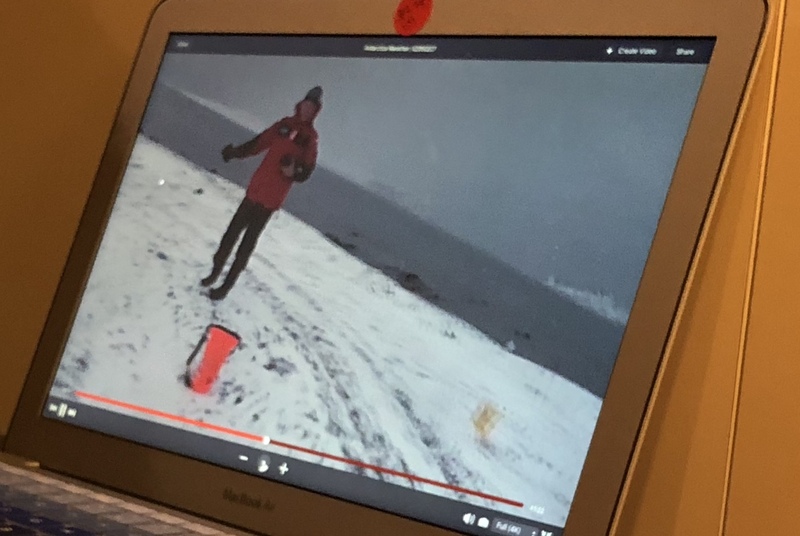 Others may say they ran the Antarctica Marathon, and perhaps they did... but I argue that one hasn't REALLY run the Antarctica Marathon until he or she has run by Molly, who sang, "I like to be in Antarctica" to the tune of West Side Story's "I like to be in America". Thank you Molly for singing for over 6 and a half hours for all of us in the freezing cold! In the end it was the people who made the Antarctica Marathon as great as it was. Unlike my other 17 marathons, in this race we ran 6 loops, and each time, coming and going, the other runners we saw would cheer us on. "Good job!" "Keep going!" "You are awesome!" were words I kept hearing from my fellow runners. It was as if we weren't competing with each other - we were just trying to help each other finish the race. And not only in the marathon. 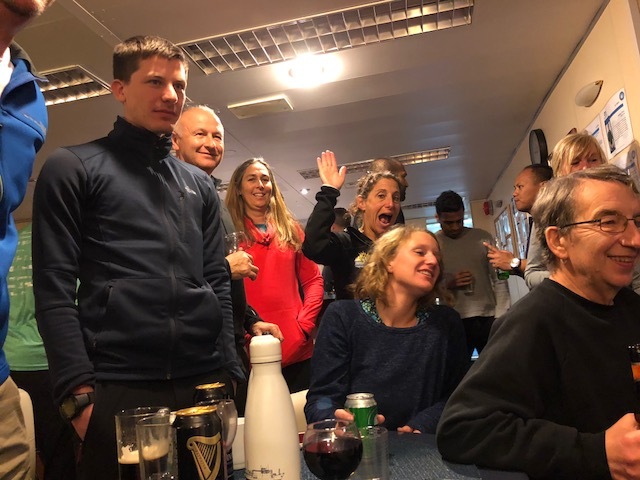 It was the people - everyone, from the Marathon Tours staff and the One Ocean Staff to the Russian sailors on the trip, and every single runner and supporter, who helped make this trip the an experience of a lifetime. 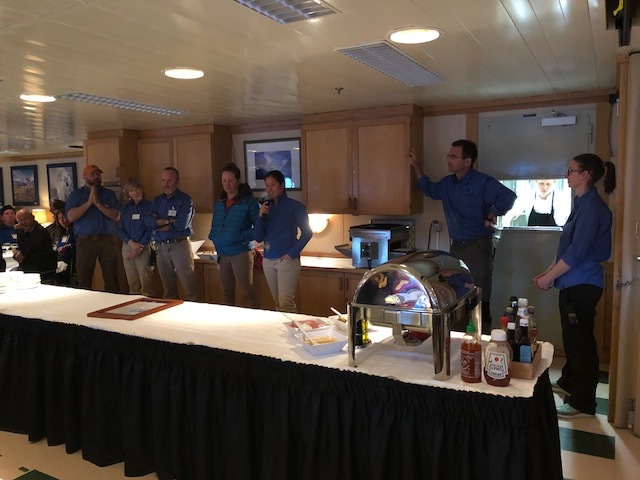 we had a lot to celebrate during our 10 day cruise! 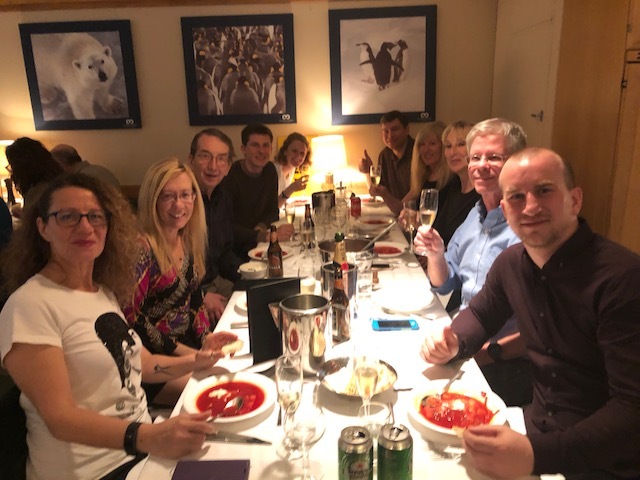 On a challenging course, in blizzard sub freezing conditions we did it - we all finished either the Antarctica Half or Full Marathon. And for 30 of us, we just finished a race on our 7th Continent. The celebrations continued on our cruise back towards Argentina, through the Drake Passage. The Drake Passage is notorious for very high winds and very high waves. We were lucky on the way to Antarctica - we had such an easy sailing during our 2 day passage, we nicknamed it the Drake Lake. But on the way back, we were hit with very high winds and seas. Chairs were chained to the floor in the dining room. We all held onto the walls or ceilings (for those of us tall enough) as we swayed through the Passage during our 2 day voyage back to Argentina. At the dinner table, we often had our table sway, knocking over glasses and plates. New nickname for the Drake: the Drake Shake. But we all took it in good stride, laughing all the way. And we danced, as we did every night in the lounge, all during ride through the Drake Passage. We had to - we had so much to celebrate! 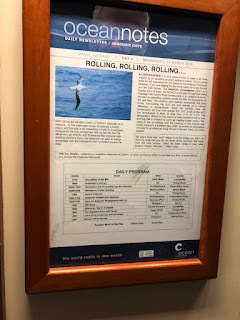 Although I still can't cross of my list "get into a bar fight", now I can cross off my list "dance during the Drake Passage, until people and furniture are falling on top of you"! But no worries, none of us (except maybe the furniture) was hurt - we just picked ourselves up and kept dancing! and we celebrated - over and over again - our new status as Antarctica Marathon or Half Marathon finishers. We also celebrated with a piece of glacier ice - who knew the things one could do with that ice? And we all got to know some of us much better through Carol's phone - fortunately or unfortunately I don't have any of those photos to post. It was so much fun hanging out with everyone in the lounge at night. We got to know some of the special skills we had - such as who knew that one of us could not only juggle small items, such as fruit, but also large bottles, and could also dance with a glass filled with liquid on top of his head? Think - the bottle dance scene from Fiddler on the Roof. to learning the Haka, the New Zealand rugby team the All Black's ritual performed before each game. I believe we all knew that we were part of something special on this trip. We hope to keep all the friendships that we made, so that we can hold onto a bit of the magic that was Antarctica. I hesitate to say goodbye to anyone I met on the Antarctica Marathon trip. I want to see you all again and again. And I believe that I will. We are all adventurers, and Antarctica should not be our last rodeo. Every day before breakfast, the One Ocean Crew had a paper that was called Ocean Notes posted at several places throughout the ship. On March 14, amidst the schedule for the day, there was this quote from Mark Twain that was described all of us. That quote - it defines us. Mark Twain said: "20 years from now, you'll regret more the things you didn't do than the ones you did. So throw off the bowlines. Sail away from the safe harbor. Catch the trade winds in your sails. Explore. Dream. Discover."